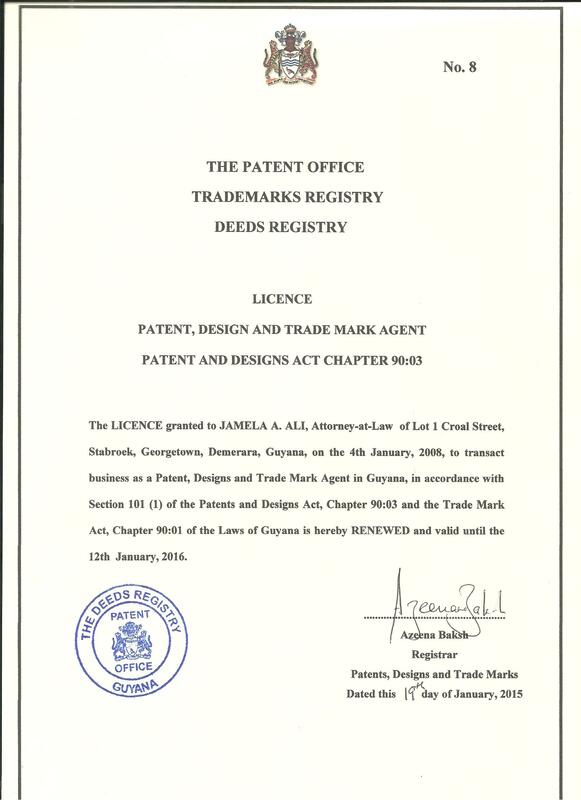 Guyana Trademark & Patent Agent/Lawyer! Services include Searches and name reservation at the Guyana Intellectual Property Office, Registration of International and Guyana Trade Marks, Renewals of Trademarks, Assignments, Change of Names, Change of Addresses, Oppositions, Court proceedings for Infringement of Trademarks and Passing off of goods. Trademarks can be registered in Part A of the Guyana TM Register in respect of goods in Classes 1 to 34. And for services in Classes 35-45 in Part C only if they are registered in the United Kingdom and a certificate issued by the United Kingdom Patent Office. UK trademarks in other Classes for goods may also be re-registered. Certified colour copy of the UK Certificate of Registration or certified true entry from the UK register of trademarks of the Comptroller General of the UK Patent Office. After filing an application to register a Trademark, a number is issued. The application is processed for advertisement and publication in the Official Gazette of Guyana inviting oppositions. If there are no oppositions, the Trademark can be placed on the Trademark Register. Part A of the TM Register - From filing date to obtaining the Trademark Certificate, once unopposed, can can take between 6 to 12 months. Part C of the TM Register can take 2 to 4 months. An Original Authorisation to Agent in Guyana (Power of Attorney) in special format (notarisation and legalisation not required) ONLY if the renewal is being done by an agent who did not register the Trademark in Guyana. It now takes about 3 weeks for the Certificate of Renewal to be issued by the Registrar. An Original Authorisation to Agent in Guyana (Power of Attorney) in special format (notarisation and legalisation not required). It can take 1-3 months for the Certificate of Subsequent Proprietor to be issued by the Registrar. We can also register Patents as claimed as well as UK Patents. A fantastic law firm always on hand to help, easy services to use, Very helpful to complete a trademark and tell us the truth and explain the trademark process. We have learnt a lot from this law firm, all we can say is excellent. Excellent services, cost-effective and quick turnaround, high level of expert advice to hand – We will prefer to use this law firm in the future and would definitely recommend the services without hesitation." Ms Jamela A Ali, LLM is an Attorney at Law with over 29 years experience. On the 24-25 February 2004, she successfully participated in the United States Patent and Trademark Office Intellectual Property Rights Enforcement workshop held in Guyana and was awarded a Certificate of Recognition. Ms Jamela A. Ali provides legal services in Contract Negotiations, Oil and Gas, Mining Law & Agreements, Conveyancing, Property matters, Trademarks, Adoption of Children, Divorces, Probates of Wills and Administration, Money Claims, Formation of Companies, Mediation, Real Estate, and Notarial services. Ms Jamela A Ali made special studies in Legislative Drafting and obtained a Masters of Law degree from UWI, Barbados, which included the Public Law courses of Constitutional and Administrative Law and a Research Paper written on Legislative Drafting, Parliamentary Counsel, Statute Law Revision, Consolidation of Laws, Law Reform, Constitution, Natural Justice, and Good Administration. Ms Jamela A. Ali is also a Trained Certified Mediator. Contact person: Ms. Jamela A. Ali, LLB (Hons)(UWI), LEC, LLM (Leg. Drafting)(UWI), MCIArb. Copyright. Jamela A. Ali 2011-2019.